Hello Everyone! I hope you are all having a good Valentine’s Day! I finally have some time to do another Angel and Spirit Guide reading for this coming week or whichever week you may find this reading. I hope it helps bring the light in you and give clarity in your week! Well it looks like Valentine’s Day will roll over to the next week because the message from our guides is to continue the wave of Romance! We get so absorbed in our day to day lives, that we find it difficult to rekindle the romance, and although Valentine’s Day is a “suggested” day to do something extra for the one you love or even for yourself, this is also a reminder that it does not need to be done only that day. The feeling of love can continue throughout the year! Remember to treat your loved one or yourself from time to time and you can keep the momentum of loving feelings. 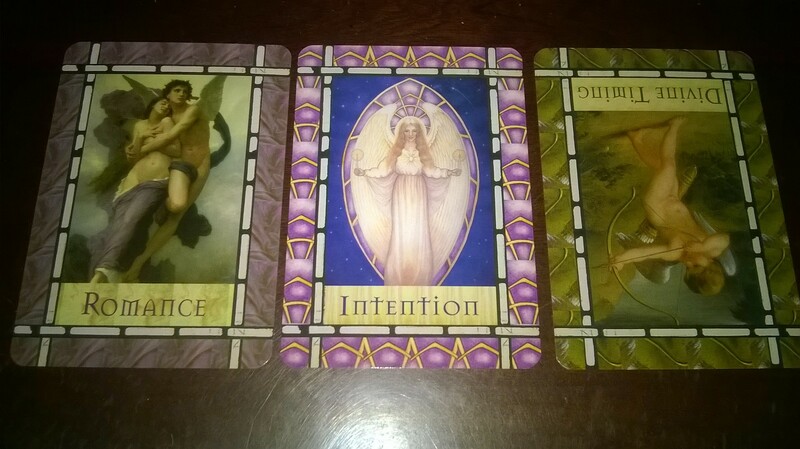 The second message is “Intention” which seems to flow with the Romance card. With these high vibration feelings of love, this is the key vibration to start to create the abundance you desire. This week, set your Intention of your goals while keeping the loving and exciting feelings with you. This helps manifest what you are wanting in your life. Remember to be grateful for the things you have and then think about the things you desire as if you already have them. This creates the vibration level that puts opportunities in your path. You may have little signs or synchronicities that your intention is coming. Thank your spirit guides for these signs and know that it’s all a matter of time. Speaking of time- the last message is Divine Timing (reversed) which may suggest that the things you try to manifest, you are wanting by a certain time frame, or you are wanting it right away. Know that there is Diving Timing with everything and the Universe/God needs to put little puzzle pieces in place for you to get what you are asking for. Know that the Universe/God will only give you the best even though it may not seem like it at the time. We only know what the puzzle looks like when the puzzle is complete, but by the end, we will understand it all. I hope this helps you through this week! If you are in the colder parts in the world like I am, I hope the love will keep you warm until spring comes! Sending love and light and positive energy your way!